Lake Cumberland is an angler's paradise. The lake is a part of the chain of lakes in Kentucky and Tennessee constructed by the Tennessee Valley Authority and the Army Corps of Engineers. Located in south central Kentucky, Lake Cumberland boasts over 1255 miles of shoreline, making it the largest manmade lake in the world. With an average water depth of 90 feet and 63,000 acres of crystal clear waters, Lake Cumberland offers some of the best striped bass fishing in the nation. Fishermen flock to the lake from across the U.S. and Canada each year to pursue the exciting, hard-fighting monster rockfish species. The Kentucky Department of Fish and Wildlife Resources has been stocking striped bass in Lake Cumberland since the late 1950's. 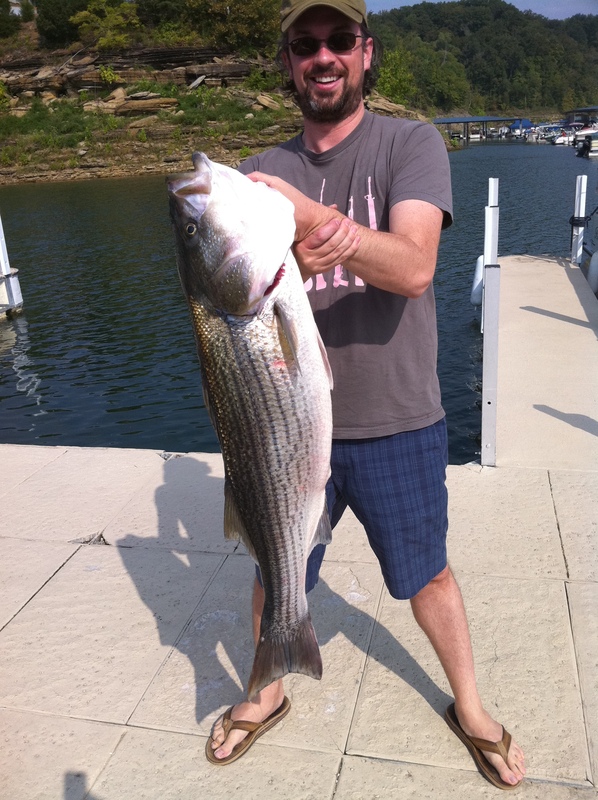 Lake Cumberland was the first lake outside of South Carolina to stock the freshwater striper. These first fish were actually mature species; then, in 1966, the first fingerling stripers were stocked, and the resulting population has done well. At Lake Cumberland they normally stock 270,000-280,000 fingerlings each year. The twenty miles of lake just above Wolf Creek Dam continue to consistently produce some of the largest stripers in the United States. A member of the perch family, the Morone saxatilis, or striped bass as we know it, can be found on both the east and west coasts of the United States. The ancestors of Cumberland's fish were saltwater striped bass who were caught in a spawning run when the gates of the dam which formed the Santee-Cooper Reservoir were closed and trapped them behind the dam where they could not return to the sea. Over the next several years, as the brackish water turned to fresh, the stripers got used to it and began spawning, creating a new fishery which may turn out to be the best of the two main stocking programs created in the last fifty years. The native Americans of Massachusetts and Narragansett nations knew the species as "Missuckeke-kequock". Nicknames have included "squid-hound", "greenhead", and the more popular "rockfish". Stripers nearly vanished on the East Coast in the 1980s - the species tends to follow cyclical patterns of boom and bust and disappeared once before after the turn of the century - but in the early 80s the fishes' fans petitioned for limits, restrictions on commercial netting, and protection of its prime spawning grounds. The fish is a classic perch type fish, predominantly silver in color with seven to eight dark lateral bands, which give the species its name. Small specimens may be mistaken for White Perch as fish under half a foot in length may lack stripes. Females begin to spawn in their fourth year when they reach a length of 18 to 24 inches; all females are sexually mature by the age of six. Males are sexually mature at 2. The species breeds until the age of 14 in the Chesapeake Bay region, but ten years elsewhere. According to McClane's New Standard Fishing Encyclopedia, four-year old females produce 65,000 eggs; 13-year old females produce nearly five million. The fish prefers to spawn in brackish water, typically in streams and rivers along its range. Spawning occurs in waters at 55 degrees. Specimens as long as six feet and as heavy as 125 pounds have been reported; however a trophy sized fish is considered anything over 30 pounds, and a 40- to 50-pound fish cause for comment and a trip to the taxidermist. The largest striped bass recorded was caught in Edenton, North Carolina in 1891, weighed an amazing 125 pounds (without the head) and is estimated to have been six feet long. Albert McReynolds in Atlantic City, New Jersey City took a 78-pound fish in 1982 on 20-pound test line. The record at Lake Cumberland was 58 pounds, 4 ounces, and was caught by Roger Foster from Somerset, Kentucky. It was taken on December 11, 1985 in the Beaver Creek area of the lake. Striped bass are roamers. They move long distances, from one area of the lake to another, usually in schools. This can frequently cause the fishermen to become quite frustrated, because they may be here this morning, five miles down the lake by afternoon, and somewhere else entirely by tomorrow. Unlike largemouths, stripers gorge themselves full, then won't feed again until their stomachs are empty. This makes striper fishing a notoriously hit-or-miss affair, even under the best of conditions. The average striper caught on Lake Cumberland is between 10-14 pounds; however, trophy fish over 30 pounds and larger are taken all the time. These monsters are known for their fighting ability. They don't leap much, but once hooked, they fight all the way to the boat, making long runs toward deep water refusing to be caught. It is important to note that recent studies on striped bass indicate catch and release of fish over 15 inches rarely results in a fish that will survive the trauma and stress of being caught. Large stripers fight so hard while being brought to the boat that as many as two-thirds of those caught and turned loose during the summer die shortly after being returned to the water, even if they look like they are in good shape when put back. Anglers should discontinue fishing for rockfish upon taking a limit to prevent hooking mortality. If you have never taken advantage of fishing for this powerful trophy fish, you should make plans to do so now. It's a fight you will remember for a lifetime.